Are you searching for an outdoor trash can but find yourself unsatisfied with the style, quality and value of traditional outdoor stainless steel trash cans, plastic trash cans and gallon trash cans? The Newport Outdoor Trash Can by Hanamint is the answer! Hanamint combines old-world production techniques with clean and classic designs creating exceptional outdoor waste receptacles perfect for an elegant porch or deck. 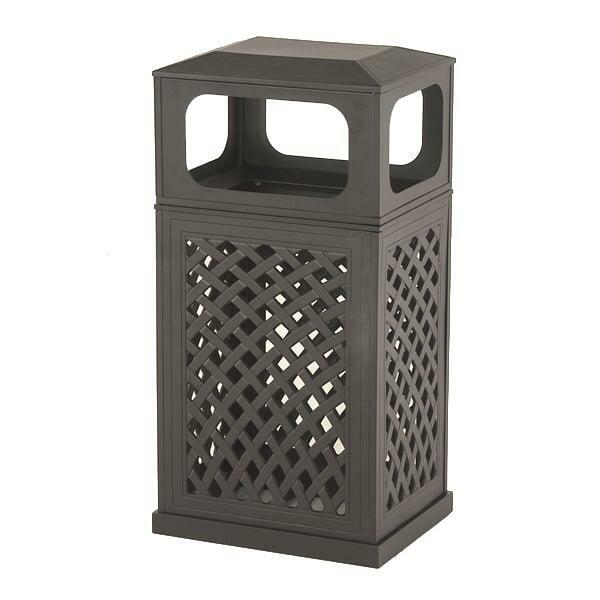 Match your outdoor patio furniture with Hanamint's outdoor patio accessories such as the Newport outdoor garbage can! This decorative trash can compliments any outdoor living space, giving your sunroom or patio a sophisticated touch. We guarantee this Hanamint outdoor trash can comes to you at the lowest price, and you'll discover Hanamint products offer elegance and class perfect for outdoor or indoor use! Quit searching for the perfect decorative metal trash can for outdoor garbage storage! Contact Family Leisure today and learn more about the Newport outdoor trash can by Hanamint!